If you’ve read out earlier feature which covered the top 10 Indian businesswomen last year, then you’ll find this post to be more of an extension of the same. 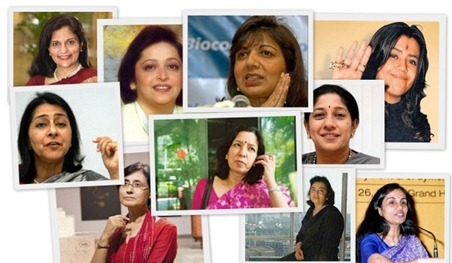 What are the qualities that what have gotten Indian women to the top spots of India Inc? Is it just about having a tough facade, compromising on family or having IIM/IIT degrees that allow them to skyrocket? No, there’s much more to that. Let’s find out. "Shared responsibilities are the only way more women will pursue careers." "We do nothing. There is no chivalry, no kid gloves, there are no affirmative action committees. Your system has to be a pure meritocracy. No woman can play the woman card’. "My passion lies in the pursuit of excellence – can I do it very well, better than others?" This lady who can also ‘command an army’, as Business Today reports, is a perfect example of what focus and excellence are all about. As the CEO of ICICI Bank, each second of her day is scheduled for and planned, including the time taken by the elevator to reach her floor. K V Kamath recalls that when he newly hired Kochhar, she achieved her annual target in the very first quarter. On the other hand Mallika Srinivasan, Tractors and Farm Equipment CEO recalls that whilst she was studying for her MBA from Wharton, she used to have her young daughter in tow, and would study in the laundry room because the hum of the washing machines helped her to concentrate. Anjali Bansal, Managing Director, Spencer Stuart India, thinks that women who are poised to be successful have a killer work ethic and according to Shailja Dutt, MD, Stellar Search, "Letting anything slip is not an option", as reported by BT. These examples only point towards the fact that being a master of your expertise/area is a critical quality to have. One quality that most top women in the Indian corporate space acknowledge is that woman needs to lose their nurturing side of obliging to keep everyone happy. You’ve got to be hard as nails and be ready to the extent of making some enemies in the workplace. For one, women in corporate India still face the wrath and envy of many men if they are climbing the ladder too quickly and secondly, trying to subvert the stereotype of being soft and submissive may tend to make female employees extra aggressive and hence piss people off. Most women in the corporate space give up when they have their first child in the age group of 25 to 35. The overwhelming workload combined with unsupportive families becomes a quick and easy reason for them to lose their cool and call it quits. But most of the top women you see in the Indian corporate space today are married, have children and yet have survived this tumultuous phase in their lives. The best way to deal with this is to think about where you will be in the next 5 years. Your responsibilities for your children would have decreased and you would be 5 years richer of work experience and perhaps a senior position. Would you want to let all of this go because of a hasty decision? "I think this gender thing is a bit overplayed. Ultimately, it is competence, skills, attitude and ability to lead that matter." Very encouraging post.. Women’s does not get support from their families and tend leave job… But I know only women’s have quality of keeping themselves intact at that point. Hats off to all the women’s. Very encouraging post! If we can balance the work-home relationship, everything can fall in place. women are always better managers and they should be given a fair chance in the board.In such case corporate governance will improve because they have guts to say right or wrong. A very true article. A working woman has dual responsibility which she has to manage with great skill and confidence. Great article! I think secrets revealed here. India is blessed with lots of woman power.